When the IPhone (and later the IPad) arrived the first things people started comparing it to were things like the movie Minority Report for its interface, and also to the technologies used in Star Trek, with its many glossy black touch panel devices. Science Fiction sometimes does a good job of – if not predicting the future – exploring the implications of many possible futures. I think Google Glass is another good example of this. 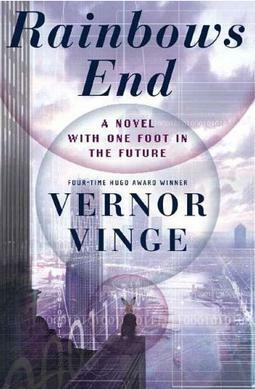 My first thought on seeing Google Glass was a fairly recent novel by Vernor Vinge, Rainbows End (2006). However, this is a novel about augmented reality, and virtualization. Its well worth reading for an exploration of how an augmented reality layer may affect society and technology, in particular his vision of a locked-down technological future where the only way of interacting with “black boxes” is via virtual interfaces does have some echoes of todays trend towards walled garden networks. However, the “overlay” aspects of Google Glass are perhaps not the most interesting. In a recent post, Mark Hurst discusses the “lifebits” recording feature of Glass. This to me immediately brought to mind two very different SF stories. In Other Days Other Eyes (1972), Bob Shaw introduced us to a world of “Slow Glass”, a materials that delays the transmission of light from one side to another. He takes us through the use of the technology as a means of ubiquitous surveillance – find a piece of glass, however small, and look through it to see what happened in the past. Google Glass, though using a very different technology, has similar properties to going around wearing a piece of Slow Glass, in that it offers the capability of looking through it into the past – via lifestreaming of video (and audio – not something Slow Glass could accomplish!). Shaw does a very thorough job of exploring the use of this technology, and I highly recommend reading the novel. In particular, there is an exploration of how society adapts to ubiquitous surveillance, which has a kind of ring of the Kübler-Ross stages of grief. Initially, efforts are made to try to avoid Glass, for example a secret meeting in the book is held in a room whose walls are freshly hosed down with a new layer of plastic each day just in case any fragments of Glass had been placed in it. However by the end of the story, everyone just accepts that anything, anywhere, and anywhen may be seen by others, with the vivid image at the end of particles of Glass suspended in raindrops. 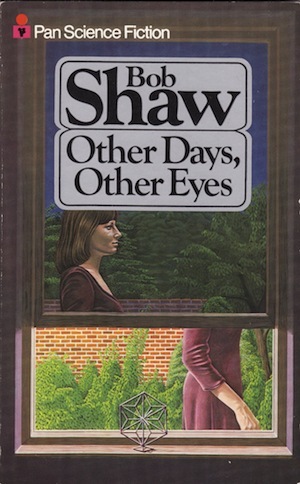 Shaw also touches on the nostalgic aspects of Glass, with a story of a man watching his lost family from outside his house. This nostalgic theme is also a key part of a very interesting short story by John Crowley, Snow (1985). Snow is told from the perspective of a widower, whose wife’s first husband had bought her a “wasp” that continually recorded video of her for posterity. In the story, the protagonist visits a futuristic memorial park where he compulsively reviews the recordings, until eventually entropy starts to set in. Again, the technology that Crowley uses here isn’t very much like Google Glass, but the implications of the story feel quite close to the near future. Crowley presents a compelling use for the lifestreaming (or lifebits, or whatever you want to call it) and also explores some of the potential downsides. Its quite short, and worth a read. Would you use Google Glass to do this? I’m sure there are many other examples of fiction anticipating a Glass-like invention, if you know of any, let me know in the comments! This entry was posted in augmented reality, google. Bookmark the permalink.